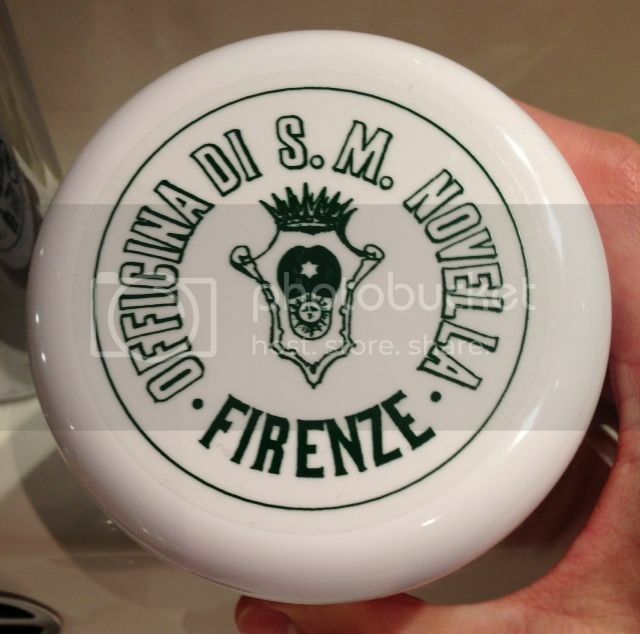 A local men's store in Melbourne just started stocking very small range of toiletries from the storied Santa Maria Novella in Florence. 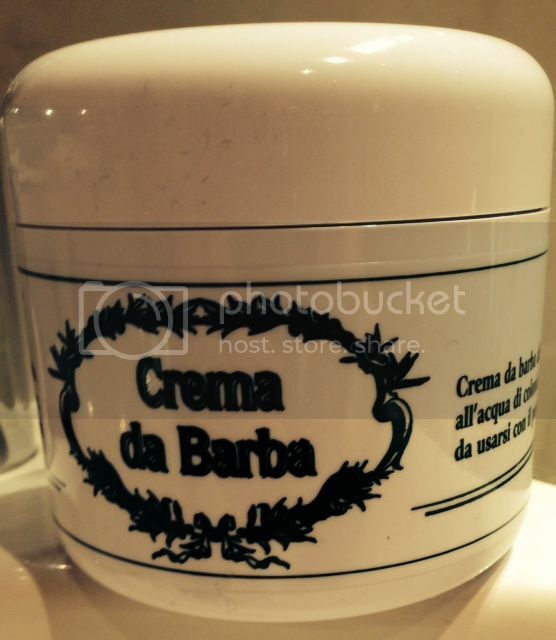 So I picked up a tub of their shaving cream (its softer stuff compared to red tub Cella). The tub is about 2-3 times the size of the red Cella. 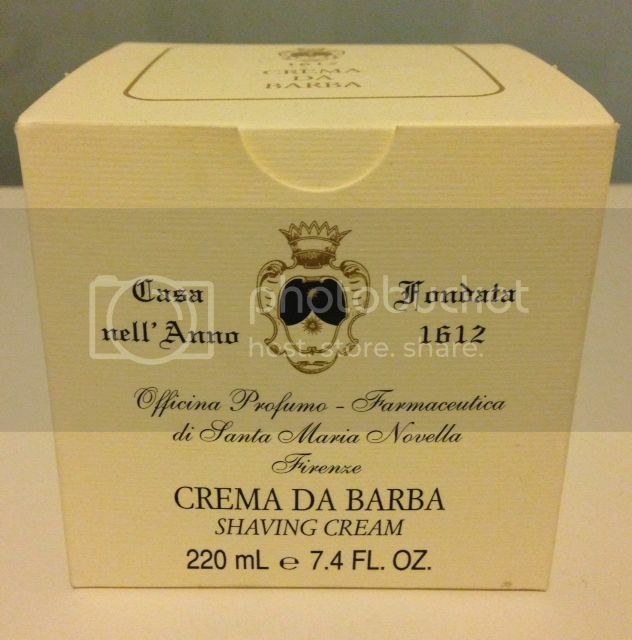 This is apparently an ancient Italian monk shaving cream (or so the marketing would have you believe). 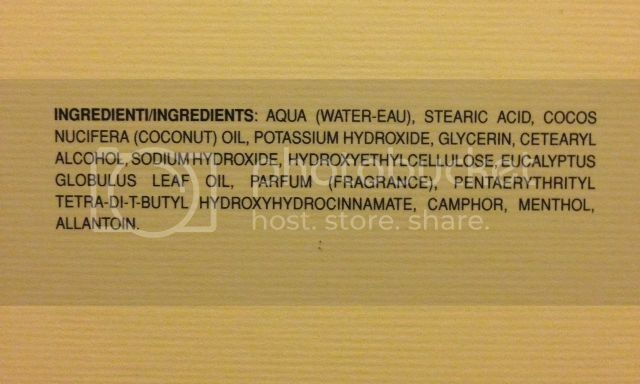 Also took a snap of the ingredient list for those interested. It's magnificent. From scent to lubrication. I am a die hard Proraso and Cella fan, but this is a cut above in my book. The tub even makes your the bathroom counter more continental looking. 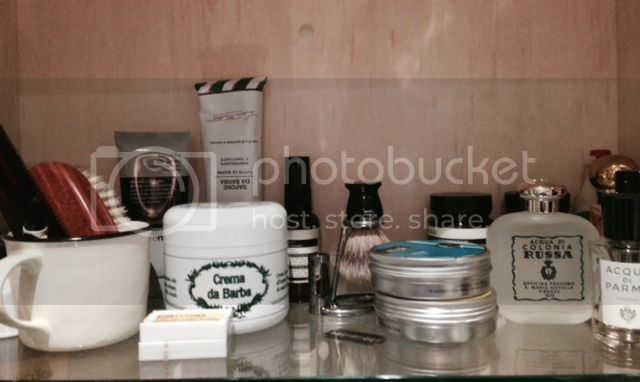 Your toiletries counter looks very classy. Maybe Zinzan can buy a tub of the monk shaving cream and dole out a tablespoon for me which will last me 1 year. My latest shaving soap is le pere lucien, love it. Easy to lather, great protection definitely my top soap now. The packaging on the le pere looks so classy. 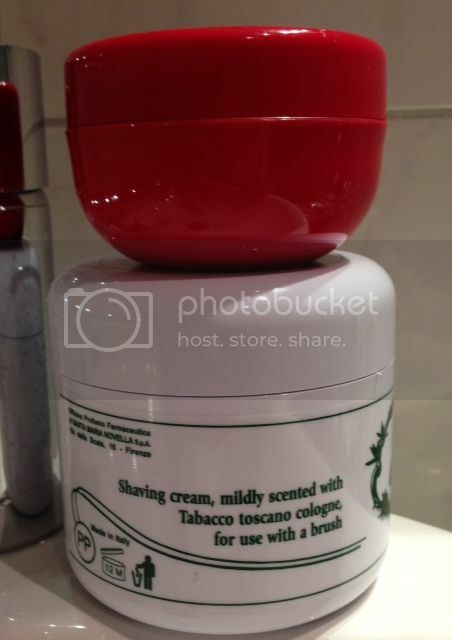 From the description, is the scent is quite strong? Sounds awesome. Yeah it's a nice metal tub with a kind of rustic paper labeling, which is pretty cool. I took the traditional which is supposed to have the stronger scent, personally I dont it find it bad. I thought cella' scent was worse. It has a mentholish and herbalish kind of smell. 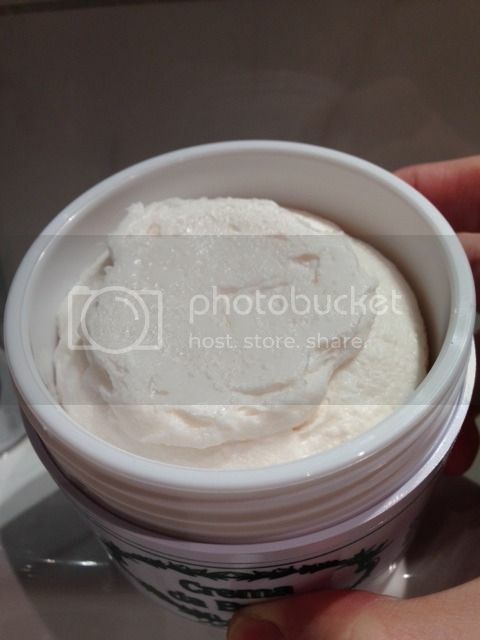 It's vegetable based and it offers different kind of protection much slicker than tallow base soap. If you are thinking getting, get it from connought shaving. They're the cheapest for shaving products and also cheapest postage on the web. I think I may have to buy another razor and brush. This is to keep in my toiletries bag for when I'm on the road. I think I may go vintage with this set. I do suggest an adjustable like the Gillette slim. It's great for travelling because you can adjust according to your growth. ^ the Gillette Aristocrat looks pretty bawse too. But its not adjustable. How do you travel with a DE blade razor? Check in baggage? I always end up having to bring a disposable razor when I'm on the road due to my disdain for checking in my luggage. The yellow, 2 blade Bics. I guess you would have to, with all the wares you have to bring along during your trunkshows. Aristocrat are quite expensive especially the british ones. I check in most of the time, so dont have much of an issue. Yeah, I always have to check in my luggage. Is there such a thing as a GPS locator for bags? It would be disastrous to have a suitcase full of other people's clothes go missing. A friend once lost his suitcase in London; another in France. Apparently if you leave 1 blade in the razor without checking in is allowed. I dont know never tried it. Went back kampung for raya thought i had blades in my dopp kit, Didnt realise it was an empty cartridge, made a run to the kedai runcit. They gillette super nacet, works beautifully with thr R41. I'm finding myself grabbing the R41 nowadays. Also using a super nacet now; not very sharp. Prefer the Egyptian Lords. I've read some positive stuff about Gem single edge razors on the shave forums. Looking forward to trying it out as a change of pace. I've been using my slim exclusively for the past 2 years or so. Anyone here have any experience with Gem razors? My new "vintage" Gillette razor - which was recently purchased before the Gem (which is still in transit). Pictured here next to the 'slim' (right). TBH - they don't 'feel' that much different, but obviously this is subjective. I will have to report back on shaving performance, although I am so happy with the slim that I doubt the fatboy will outperform it by much. You got the fatboy, well done!!! Oh man, you HAD to post that link! I'm supposed to buy a lens this month and it looks like it's this Feather instead. $140 Edit: $150 (!) is pretty steep for a razor. I think it might be priced in USD actually. You are right. Maybe I should get a vintage Gillette after all. But $150 is objectively not much money for something you will use almost daily for a very long time; also it typically sells for $200. Feather AS-D2 is well made and very smooth shaver and definitely top the line razor. Never used one so cant comment on aggressiveness but the consensus is, it's slightly more aggressive than EJ. But I think i paid in equivalent in monetary terms maybe lesser, razor, plating and shipping to do my slims to a rhodium plating. I'm not knocking off new razors i love my vintages but nowadays my weapon of choice is Muhle R41. As you can see im on the fence on this New vs Vintage thing. But my thoughts are after EJ, you'd be served well with an adjustable. Yeh, when you put it that way - I guess $200 of value depreciated over at least 2 generations is pretty solid value. If you're set on a nice looking non-adjustable, what about getting a slant bar - the Merkur 34 or 37 series? For something different, I haven't tried personally, as I am experimenting with GEM SE razors now - but looks interesting. To my horror and annoyance - I think I am preferring my slim over the fatboy. Shock horror!!! Hope you didnt overpay for it. But i never saw 1 reasonable fat boy on the market. Hey thats a collector's so can easily hive it off if you need to. The R41 is an awesome shaver. It gets the growth under the sides of my chin so cleanly, its so amazing. In fact now i can shave once a week and have a really good shave. It used to be quite spotty shave if i leave more than 3 days growth. I think this as close as you get to having a straights. I still love my slims, i use it for travel. And i think its much more beautiful razor than anything that is in current production now. J, I think you should get this, very reasonably priced for an Ikon razor its reasonably priced and its an open comb. I enjoy my open comb gives much closer shave.